Have questions? Drop us a line below and we'll get right back to you! CLIFTON – It’s an entrepreneurial tale of dishrags to riches, of a busboy becoming a businessman. 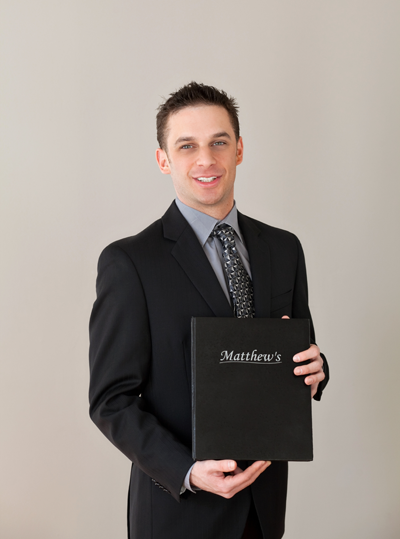 Matthew Tyahla’s career in the food service industry began humbly at La Finestra, an Italian restaurant located a stone’s throw from his home on Vincem Drive. After repeatedly bugging the restaurant’s owner to see if he was hiring, Tyahla finally got his way and, at 14 years old, landed his first job serving as a food-runner and busboy on the weekends. “I fell in love with the business from day one,” he said. Tvahla stayed at the restaurant for the next two years until it closed in 2000. His job search did not last long and he began again as a food-runner at the Bloomfield Avenue establishment Bella Napoli which later became Cafe d’ Amici. After becoming a busboy, Tvahla later joined the waitstaff, working diligently through high school and college up until the last table cleared when Cafe d’ Amici dosed last August. Through good and bad times, his co-workers said the enterprising Clifton native remained a reliable stalwart for staff and customers to lean on. Amy Barklow, 34, worked with Tvahla for several years and was an experienced waitress when he first began working at the restaurant as a teenager. With a decade spent at the eatery, Tyahla had not only learned the restaurant business from the inside out but was also armed with a degree in business communications from Ramapo College. Although just 26 years old, Tyahla said he had been saving up his money since he was 5 years old and saw the closure of Cafe d’ Amici as a potential once-in-a-lifetime break. While aware of the risk and challenges which punctuated the decision, Tyahla did not seek financial backing from family or friends and instead sought to acquire the restaurant himself. He said the restaurant’s future lay entirely on his shoulders and, as its sole owner, so did the risk. Over the next 100 days Tyahla sifted through a seemingly endless collection of permits, applications, registrations, fees and contracts. From the type of salt and pepper shakers to the color of the dining room’s floor to the font style used on the menus, he was responsible for every aspect of the business. With a new decor Tyahla called “chic, clean, sophisticated yet comfortable” accompanied by a revamped lunch menu and entirely new wine list, Mathew’s Italian Restaurant officially opened its doors on Dec. 14,2010. Though she had left Cafe d’ Amici two years before it closed, Barklow said she gave Tyahla “a resounding yes” when he asked her to return as a waitress and bartender. Although skeptical Matthew’s would succeed so quickly, Barklow was not the least bit surprised to see her friend become a business owner. Ciiftonite John Resciniti, one of Tyahla’s closest friends since childhood, also said he was initially concerned about his friend’s decision but has since come away “totally impressed” by the restaurant’s success and quality. Barklow echoed Resciniti’s sentiments, going a step further because the restaurant’s success has come from clientele word-of-mouth considering Tvahla has done very little advertising. Also hearing nothing but positive feedback from Matthew’s patrons Barklow said she can’t remember a time when anyone was happier than Tyahla is now.